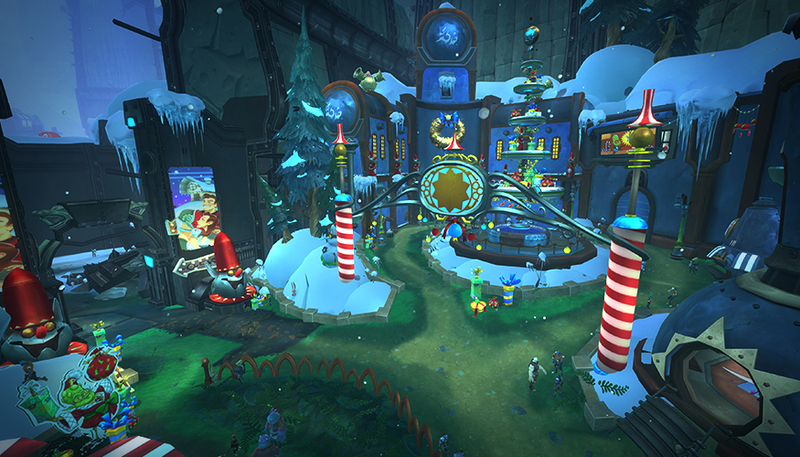 From 10am December 18 to 10am January 1, you are able to join Protostar's Gala Winterfest to celebrate the most profitable of seasons. By helping out Protostar, players earn a currency that can be used to purchase season-specific goods including some brand new goodies for 2016. Players can get hold of toys, mounts, housing items, costumes and much more. Things can be purchased for Protobucks or with OmniBits. In the time-honored traditions of consumer acquisition and retention, the Protostar Corporation is looking to reward YOU with limited-time ColdCash for helping them out around the holidays. In addition to all the great, just absolutely great, tremendous deals you're going to get with your ColdCash, this year we also have a great selection of items now purchasable with your holiday currency. The centerpiece of Winterfest is the majestic, duty-free, majestic, profit-oriented, majestic, and gravity-defying Protostar SuperMall-in-the-Sky. Take a leisurely ride up for a shopping spree you'll not soon forget-and might not see again! Winterfest is about the joy of handing over money for stuff you need (or at least want a whole lot): toys, mounts, housing décor, costumes, and more! While most items sold by Protostar either come directly from the festivities-or purchased with ColdCash you earn from those festivities-new and time-limited exclusives are also available from the In-Game Store for Protobucks or OmniBits (a free in-game currency earned alongside XP). Start playing WildStar today for free! More details you can check on the official site.